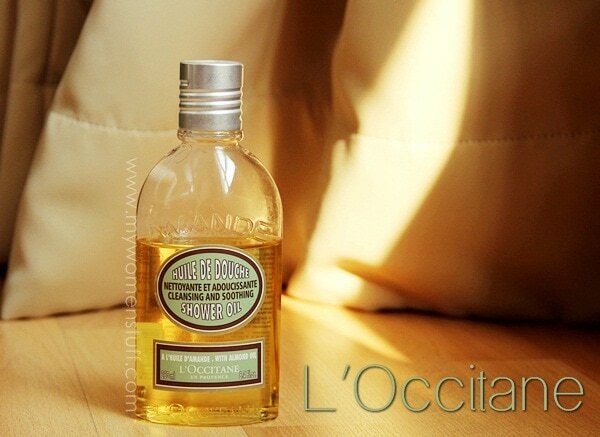 Home » Bath & Body » Bathing Beauty: The L’Occitane Almond Shower Oil is my luxury shower treat! 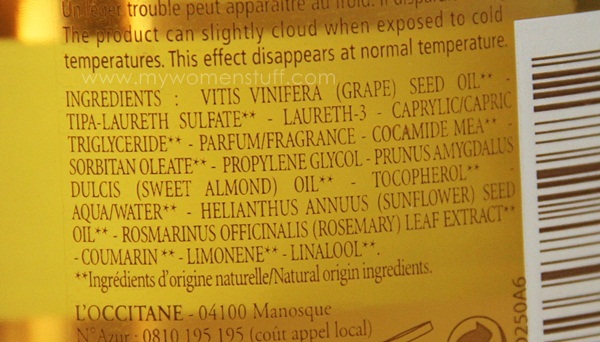 Bathing Beauty: The L’Occitane Almond Shower Oil is my luxury shower treat! 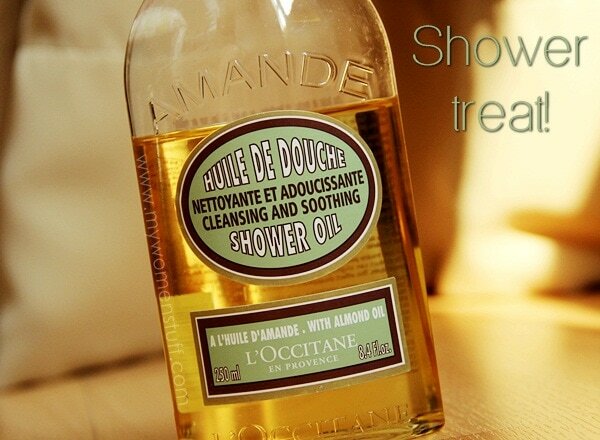 The L’Occitane Almond Shower Oil is, I believe, one of the hidden gems in the brand. Ok, maybe not so hidden because I know of many who are great fans of it. Its been around a while, and I’d heard a lot about it, but it was only relatively recently that I actually tried it. The L’Occitane Shower Oil comes in only one scent – Almond. I’m not the biggest fan of almonds whether in the form of scent or the nut, but I must say that it isn’t too bad. It is quite a strong scent and leaves the bathroom perfumed for a while after. There is no way that someone can secretly use your Almond Shower Oil, because the minute you step into the bathroom, you will know. The smell lingers… and its quite nice. The bottle is a flip top cap that is easy to manage in the shower. The shower oil pours out quite thickly and has the exact amber shade that you see in these photos. It does not feel like conventional oil in the sense of being oily and sticky. It is rather like a face cleansing oil, if you are familiar with that. Unlike a face cleansing oil, you do not need to use this on dry skin. I usually pour a sizeable portion in the palm of my hand, then apply all over. You don’t really need very much, because when you emulsify it with water, it covers a wider area, if that makes sense. When it comes into contact with water, it will turn into a milky liquid. I hesitate to call it a foam, because it does not foam nor lather up as a regular shower gel does. It just turns into a thick milky liquid that has lovely slip and washes off easily, leaving skin feeling moist and soothed. I find a little strangely, that when the oil comes into contact with water, it turns a little warm. Not scary hot, but just a little warm, like warmed up massage oil. I attribute this to the reaction between the oil and water but it will be interesting to see if anyone else experiences this. I’d love to use this everyday if I could. My nose likes the scent, and my skin loves how smooth and soft it feels after use. But due to the cost, its a treat – a luxury shower treat! I wonder if L’Occitane will come up with a Lavender version – I’d love that! The L’Occitane Almond Shower Oil is an oil that, upon contact with water, turns into a milky emulsion that cleanses skin yet leaves it feeling soft and smooth. The scent is quite strong and will linger on the skin and in the air. Its quite a nice, albeit sweet scent. Be careful using this in the shower, because if water gets in, I can imagine it will not be as effective anymore. Here is the ingredient list of the product. I love this shower oil and I’m now terribly intrigued by the concept of shower oils. I’m familiar with bath oils but not owning a bath tub is a bit of a problem so my only option is shower oils. Other than this one by L’Occitane, I’m not familiar with any other brand that carries shower oils though. This is my go to luxury shower oil. I love that it doesn’t dry out my skin, and it actually helps keeps my skin soft throughout the day. Absolutely love this! It’s such a lovely treat for the skin. I’m so glad I succumbed and I’m now looking for more shower oils in the market. Not many it seems. hey PAris…I didn’t get quite exactly that what is it??? is it a cleanser??? how much do you need for one shower??? Think shower gel but like a cleansing oil 😉 it’s basically a oil based body wash and very nice. I don’t use very much each time, maybe the size of a large coin? Awesome! I’m sure you’ll love it! I wasn’t too keen on slathering myself with almond oil since I’m not that much a fan of almonds but the shower oil is an exception 😀 Glad you like it too! I am one of the silent reader since years ago, been hearing alots of great review from you on L’Ocittane almond shower oil. Thus I decided to splurge for this luxury oil when it is now tax free. It really smell soooo nice and skin feel soft and supple even after few times of application.